Welcome to my blog. I am so excited to share with you an up close and personal look into my life. Find the suite that he comes alive in, the suite that makes him feel the most confident that he’s ever felt. Troy was set on an all black. He went to Mens Warehouse but did not like the customer service there. He was overwhelmed and needed my help to find his perfect fit. We started out at Jos A Banks in the Green Hills Mall. Troy tried on his all black tuxedo. He said he felt like he was going to a funeral. The sales associate David, said that with Troys build (6’5) he had a custom suite in the same size for Troy to try on. The suite was in a navy color and Troy was not in love with the color but then he put the suite on and it was as if he came alive. His body language shifted, he was smiling and stood up straighter. It was his suite. 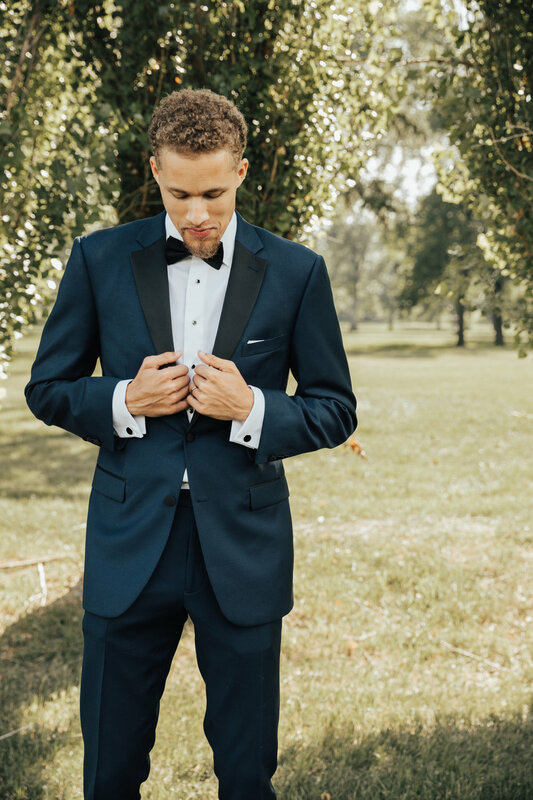 He got to order the custom Italian fabric and color, custom lapel in black satin, custom lining and even a label on the inside of the coat with his name and our wedding date on it. We changed our wedding colors that day because that color made Troy, who I personally think looks good in any color, but that color brought out his eyes and made him feel so good. In any form of clothing, a jacket is a jacket, pants are pants, it is how you feel in the items. It is the emotions you feel when you have it on you, the confidence that comes out of you when your in that suite. Especially since on your wedding day, lets face it, literally every eye is on you. You need to feel the most confident you’ve ever felt. You shouldn’t worry about what others will think of the color or the style. It is your day, wear what you feel the best in. We ordered Troys custom suite and were told approximately two to three months for it to come in. It took longer than that Id say four to five months, which thankfully we had ordered it way ahead of time. I highly suggest getting the suite and Dress ordered Immediately. Suite arrived in May and even though it was custom to Troy he had to have alterations. My husband has very slim legs so they had to bring his pants in a lot and his jacket they made a little tighter. 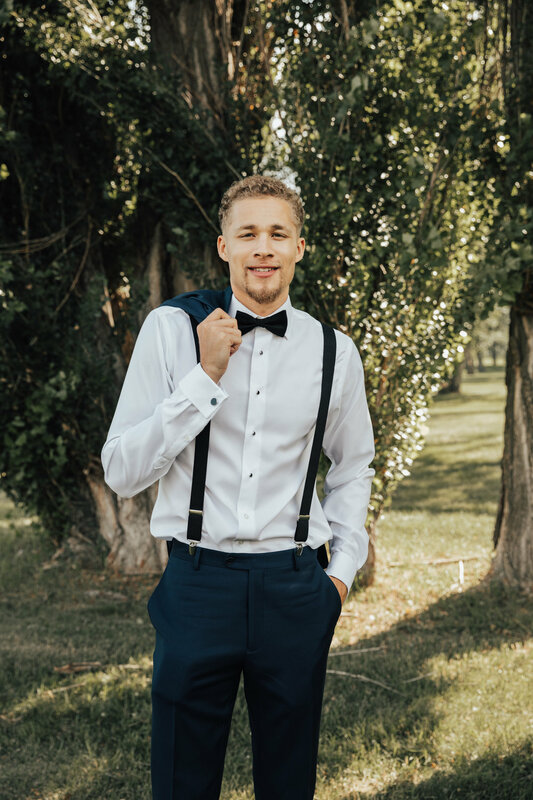 We were able to order Bow Ties for the group of groomsman and Troy chose suspenders and white pocket squares as well for himself and his crew. His groomsman ordered their own custom suites without the black satin lapel to make Troy stand out. 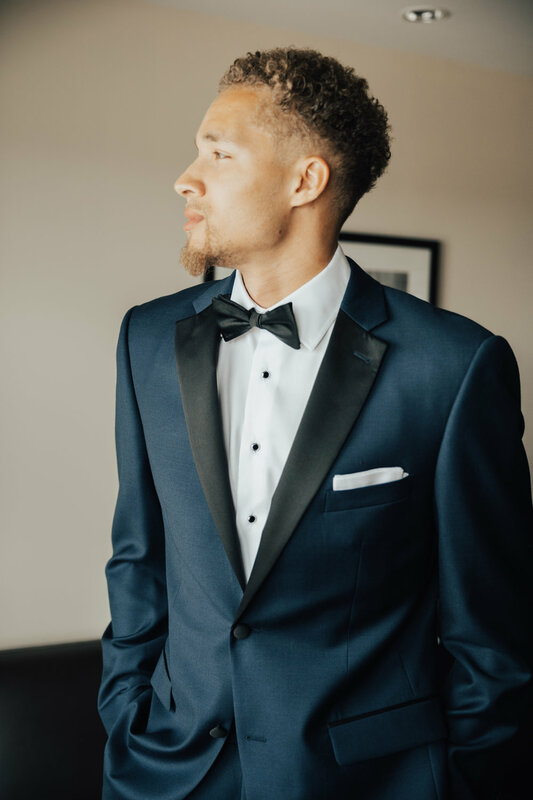 Since all of Troys groomsman do not live here in Nashville it was easy for them to go into either their local Jos A Banks OR get professionally measured and call into Jos A Banks and order their custom suite. The quality of his suite was unreal and we both highly recommend Jos A Banks. Make sure you give yourself ample amount of time for the suite to come in and be altered. Do not leave this until month of the wedding. Shoes, took multiple trips and multiple styles. Troy found this gorgeous pair at ALDOS. Let’s stay connected! I am excited to share my journey of becoming Mrs Huff and life going forward as a Wife. Thank you for subscribing. I am excited to share my life with you and in return tell me about yourself! I would love to learn about you and follow your journey through life as well. Especially if you are a bride to be, Congratulations! Please let me know if I can help you out in ANYWAY and have the best engagement ever.